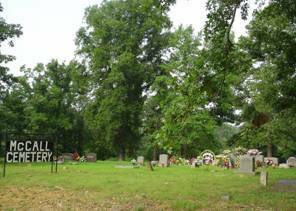 The McCall cemetery lies about two to three miles north of Collinwood Tennessee beside State Highway 13 N. It is a fairly small cemetery with space to grow. There are about eight unknown graves here marked with fieldstones. Smothermon, Wilburn F.; b. 07 Feb 1920, d. 25 Aug 1946, Tec 5 232nd Station Hosp.